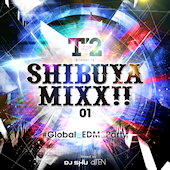 New digital non-stop mix that’s a collaboration between FARM Records and T2 Shibuya, a club in Shibuya, Japan. It’s mostly EDM from Spinnin’ Records. Mixed by DJ Shu and DJ Ten (yes, that DJ Ten).